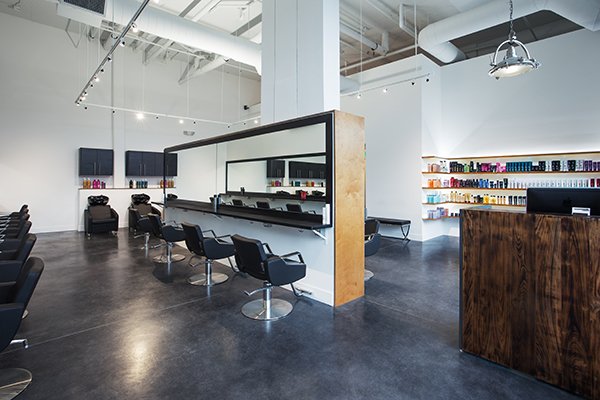 “Hair follows fashion and Seattle is a fashionable city,” say the owners of essensuals London, Capitol Hill’s newest boutique hair salon. These were just some motivating factors that led the Townsend brothers to relocate from San Diego to Seattle and open essensuals London. Prior to relocating to the Northwest, both brothers personally styled a bevy of A-lister celebrities from London to New York and Los Angeles. You’re not seeing double, the owners are identical twin brothers. Jason and Robert Townsend said they fell in love with Seattle even before they called it their new home. The brothers’ salon is here to deliver Seattleites fashion-forward looks for everyday wear. Their styling, cut, and color services are inspired by London fashion. essensuals London is Part of the highly acclaimed TONI&GUY London brand family, and exclusively uses and carries the top hair care products for retail like the Label.M, Redken and Purelology lines. The hairdressing tools they sell at the Seattle location have been tested and approved by the prestigious TONI&GUY UK international artistic directors and Redken 5th Ave New York. Customers can stop for a quick lesson on using any of the products by any of the stylists before purchasing. “High-fashion and beautiful hair should be more accessible and our ultimate goal to make essensuals London synonymous with affordable luxury,” said Robert. We got to know a little more about the brothers’ new love for the Pacific Northwest before their grand opening. If you want to get to know them in person, take a seat in one of their designer studio chairs, enjoy your own individual French Press, tea, red wine or water, and let them do their magic. Describe that moment when you decided Seattle was going to be the next city to expansion. We came to Seattle for a visit and to see a hair show by a major hair color company we were considering partnering with. While at the show, we noticed that the people in the audience looked cooler and more fashionable than the people on stage. That was when we knew this was the right city to be in. When we took a closer look at Seattle we noticed how family oriented the city is and we realized it had the stability and sense of community unity, which we felt was lacking in LA. Why did you choose Capitol Hill? What other neighborhoods did you consider? Opening our salon in Capitol Hill was a no-brainer for us – it is such a cool area with a great music scene and so many trends seem to begin here. Over the last few years, Capitol Hill has experienced a massive resurgence with a lot of new restaurants and clothing shops popping up we wanted essensuals London to be in the center of all of that. We absolutely feel we picked a great place to grow with the community. We considered Belltown, Pioneer Square and Downtown, but those areas didn’t radiate the same unique vibe as Capitol Hill. Capitol Hill reminds us of the east side of London, New York’s SoHo neighborhood, and LA’s Melrose AVE – all mixed into one. Label M the is the only product line used backstage at London Fashion Week, what else makes Label M stand out to you? Label M is a very client friendly line because it does exactly what it says it will. There’s no guess-work involved. We stand behind Label M 100% – and if a product doesn’t work for you, you can return it! To us, there is nothing worse than buying a product and getting home and not feeling confident in how to use or why you are using it and it eventually ends up in your product graveyard (under your sink). In an effort to remedy this, we offer complimentary blow dry lessons in the salon and we’ll teach you how to properly use your new hair products.We also have our Organics line that is 67% Organic, Paraben, Sulphate, and Sodium Chloride free, if it were any more organic it would have to come in a brown glass bottle and be refrigerated. No other hair salon can say that. What’s next for London inspired hairstyles? What will we see more of in Seattle in 2015? We are seeing a lot more texture and movement and softer lines that give hair a more lived-in and relaxed feeling. To achieve this look, we are using more curling wands or just letting the hair air dry to get that no fuss airy feeling. That’s when you know you have a great cut. With the Ombre look on its way out, color is becoming more muted and softer which creates a beachy look – as if you just spent a weekend in Mexico. Angel Lights is a perfect example of what this color looks like. We are fortunate to have a close relationship with London Fashion Week as it’s provided us exclusive, first-hand looks at what’s new for hair. In London, we are seeing more of the easy, lived-in hair and soft colors. And in Seattle, We are already seeing more of these trends happening here and are finding clients are very open to it. What are your fondest memories in all the years you’ve been in hair/fashion? Jason Townsend – For me, it was growing up in my mother’s hair salon with my brother. To this day, the scent of certain hair products can take me right back to those days. Another time was when I was styling hair at London Fashion Week and I looked out in the audience and saw Kate Moss and Florence from Florence and the Machine. It hit me that they just saw my work on stage. Robert Townsend – Working on stage with my brother in front of thousands of people and working in my mom’s salon as a kid. Posted in Fashion, Featured, Seattleites. Bookmark the permalink.